Skoda's Scala is offering space as a major selling point. Called the Scala, It's promised to be bigger and more spacious than the outgoing model and Skoda now has cars like the Ford Focus, the Golf and the Opel Astra in its sights. Skoda says the new car will be big enough to be compared to its current Octavia model. It measures 4.3 metres in length, 1.79 in width and is 1.4 metres high. 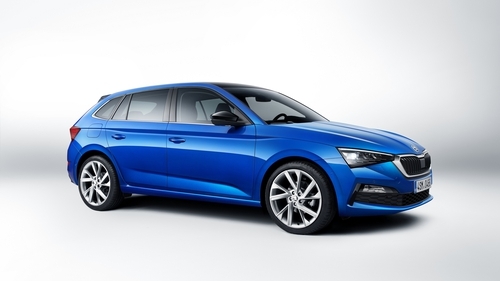 This is a good deal longer, wider and higher than the Fabia and the car will also have one of the largest boots in its class with a capacity of 467 litres, which increases to 1,410 litres with the rear seats folded down. Skoda has made a real virtue out of providing plenty of interior and boot space - enough to rattle the competition and keep half of Europe's taxi drivers happy. There are four engines available but a 1.0 litre petrol is likely to be the big seller in Ireland. There will be a choice of four engines, which include three petrol engines and one diesel. All engines come with direct injection and a turbocharger as well as Stop/Start technology and brake energy recovery. Skoda says the 1.0TSI 95hp petrol engine is set to be the most popular among Irish customers and is matched with a manual 5-speed gearbox as standard. The 1.0TSI 115hp and 1.5 TSI 150bhp petrol version is available with a manual 6-speed gearbox or an automatic 7-speed DSG option. The 1.6 TDI 115hp diesel version will only be offered with a 7-speed DSG transmission. The car also features LED headlights and taillights as standard, with full‑LED versions available as an option. Big infotainment screens are promised and will be as big as 10.25 inches, although this size will cost extra. Final pricing and specification will not be confirmed until March but in Ireland, SCALA will follow the conventional ŠKODA trim line structure of Active, Ambition and Style.